Niche: Helping auto-dealers/coaches get more clients with messenger chat bots. 1. What life looked like back in 2017 when Andrew joined the program. 2. How Andrew picked his niche. 3. Andrew’s process for delivering value with messenger chat bots. 4. How Andrew landed his first client..
5. The deliverables Andrew provides to his clients. Don’t overanalyze. Leave your fear at home. Take action. Sam Ovens:	Hey everyone. Sam Ovens here and today I have one of our Consulting Accelerator customers on with us, Andrew Bilak. And Andrew helps coaches get clients and customers. And his specialty is really messenger bots or chat bots. And he joined Consulting Accelerator in January 2017, last year. And at that point, he had a nine to five job and he hadn't started his business but obviously had intentions to start one. And then, he joined the Consulting Accelerator around then. And since joining, he's been able to start his business and grow it to the point right now where it's making around $6,500 per month. Sam Ovens:	So on today's interview, we're going to discuss his story, why he picked this specific niche, how he made the transition out of his nine to five job and into business full-time making 6500 a month, and you know how he was able to get his first clients and all of that stuff. Sam Ovens:	So let's jump right into the start. Like back in Jan 2017. Tell me what was going on then. You're working in this job, what was going on? Andrew:	Yeah so I knew I wanted to do something in terms of starting my own business. Kind of growing up, I helped put myself through university by starting my own window cleaning business. And when I got a taste of kind of the entrepreneurial life, I absolutely fell in love with it. I couldn't scale that business any further than I could. I was at kind of a loss as to where I wanted to go next. So you know I took a typical nine to five job. I hated every minute of it. It was good. I mean I've been in sales my whole life but I knew there was something more that I wanted to achieve and that was going to be through venturing out and starting my own business. Andrew:	So I actually saw an ad for your course. You know I looked into it and I jumped into it. I purchased the course. I was going through it. I found a lot of value in the sales script that I applied to my current job that I was in at the time. And it actually really helped increase my sales. But I knew at the end of the day that I wasn't gonna stay there. Andrew:	So around March of 2017, I made the jump into my own social media marketing business, specifically geared at hospitality. And I was leveraging all the different facets of the course, you know the mindset training. You know elevating who it was that I was becoming in terms of ... but I didn't really find the fulfillment in social media management. It was great to be my own boss, but it was funny. Andrew:	In and of that time, I connected with an old friend who was now my current business partner. And he introduced me to something called messenger chat bots. I'm sure many of you who are gonna be watching this have probably heard a lot about messenger chat because they're really predominant in especially marketing circles these days. But it was at that time that everything kind of shifted. You know we started gaining a lot more momentum because it was something that was new, something that was helping push the envelope forward for the niches that we were in. Andrew:	So we actually started off in the real estate industry. And from there, real estate, we thought there's so many realtors that can definitely benefit from this because essentially with messenger chat, what you're doing with messenger chat is the underlying principle is to teach, build trust, sell. And this is all done through kind of automation within the chat bot. So if someone comes into it and kind of clicks the get started button, they essentially will get predetermined messages that have been built out ahead of time. So for real estate, you can essentially put your entire qualifying sequence or qualifying questions for any prospect that comes into it. So you can ask a wide range of questions. We thought you know this is a gold mine right here because there's so many realtors that need this that would benefit from this along with people who are looking for realtors. [inaudible 00:04:22] Andrew:	I found that unless you're working with the top one percent of realtors that have consistent business coming in time after time, it's a very seasonal game. And realtors might not have the budget here or there. So for a good chunk of time, about three or four months, we were slugging through and not getting much traction in the real estate niche. We actually came to the niche with a solution in search of a problem. And by going through your course, time after time I realized that that was not the right way to do it, you know? You have to go into it, you have to search for the pains, the problems, the solutions, to get them from their desired situation or from their current situation to their desired situation. Andrew:	And so we kinda revamped our strategy. We revamped our thinking. And we said let's take a look at the coaching industry, the consulting industry. Everyone seems to have similar pain points. And that's coming from a perspective where we kind of looked at what are the main traction methods that people use to land clients? And that's through Facebook ads. And point in case was I learned a lot through building out a fragmentation funnel. My VSL video, setting up calls, doing everything that you taught us in the course to get more clients in this way and learn about their pains and where they wanted to go. Andrew:	And so from there, we essentially took messenger chat and we kind of flipped that on its head. Because instead of, for coaches, instead of them directing people through ads to a landing page and then from there getting on, we got the VSL video, and then getting through to the survey and then booking a call, with messenger chat, if you put that into a Facebook ad, we found that as soon as someone clicks on the ad or interacts with it, they become subscribed to your messenger chat bot. So now you own that traffic. And within that, you can then put out your information. You can then put out your VSL or your Webinar with the main call to action is people want to get more enrollment calls. Andrew:	And so by controlling the traffic at the point of entry, even if someone doesn't watch your VSL video all the way through or your Webinar or doesn't book a call with you, you now have the ability to followup. And it saves our clients so much money. And not only that, it's solving their issues by creating this kind of ecosystem where people come into and you learn about what their business has to offer. Andrew:	The fundamental aspects of chat bots: teach, build trust, sell. Without you having to ever be there. So with these predetermined messages set ahead of time that we build out for our clients, we essentially are creating this ecosystem for their prospects to come in to engage with in a fun and interactive way. And then from there, whether or not they purchase at that point of interaction, you have the direct ability to followup with them because now this is traffic that you control, that you own. Sam Ovens:	Got it. So this one's interesting because I've looked into these chat bot things. And I've looked at all the numbers. So I'm interested to learn more about this. So back, we'll go through the different stages. Because you know we kind of covered the whole story there. You know what I mean? So back when you had your job, why did you even want to quit? Why were you unsatisfied with it? Andrew:	I mean, I've had this burning desire to ... when I had that window cleaning business, that was the first real taste I got at being my own boss. Kind of controlling my own fate. That's kinda what always drew me to it is that I'm in control of anything and everything that happens to me. And I didn't want to kinda succumb to having a boss in my nine to five. You know there's benefits to having people to guide you and learn from, you know mentorship. But there's nothing that I wanted to do for the long haul. I knew for myself, it was up to me to test those waters and take the leap and jump into starting my own business. And at the end of the day for me, the reasoning was if you never do this now, you probably never will. And if something doesn't work out and if it doesn't work out in the short term or the long run, those nine to five jobs are not going anywhere. Sam Ovens:	Got it. And then so you decided to quit and then ... Well you joined Accelerator before you quit, right? Andrew:	I did. Yes. Sam Ovens:	And then the first stage really in the program is you know trying to find a niche. But you kinda had a solution in mind that you kind of had as your niche. The chat box. And then you tried to apply it to real estate but realized you had a solution trying to fit it to a problem. But then didn't you do the same thing again with coaches? Because you still bought the same solution? Andrew:	In a way, yes. What we did was we actually listened more to the market. I know that coming from a standpoint of generalizing doesn't work all the time. But what we found with messenger chat bots was no matter what industry or niche you are in with coaching, they all had the same problem. And that was generating more leads that would in turn turn into enrollment calls, that they would lead to strategy sessions that they would try and close. Sam Ovens:	Sounds like people just want the customers, right? Andrew:	Yes. Sam Ovens:	So the problem that you found in the coaching market was people want customers. And I know that exists because that's what I sell. You know what I mean? Like coaches, consultants, service providers. So I definitely know that exists. I know that problem. But then how did you determine that chat bots was the best solution for that problem? Andrew:	Because it was kind of two-fold. The fact of the matter was that this was something new to the market. Recently new. And it's something that kind of transcends what people want to do through their VSLs, through their Webinars. And that's to kind of inform and teach people. And by doing that, they want to build trust in that short amount of time that will compel their prospect to then get on a call with them, feel comfortable enough in that short amount of time, and then get on a call with them. And in turn, they wanna close them. And with chat bots, since they go into that kind of ecosystem where you can put any message that you want. You can put sections about you know learn about Sam Ovens, his trainings. A quick value add of like here, download my war map. The fact of the matter is is that no matter how many times someone comes into that, the first time they come in, they can always come back and pick up where they left off or continue through the chat bot and kind of view all the different things that you have going on. Andrew:	And in turn for you, you capture that audience. You capture that traffic. So no matter if I purchase something from you now or eight years down the line, you don't have to spend money retargeting me through Facebook ads or through pixels or anything like that because you already own that traffic. And you can essentially go back into messenger and send me a message. And I'll receive it as if it was sent from a friend. Because by opting in to a messenger chat bot, it's essentially like adding someone as a friend on Facebook without having them as a friend. And that message will go through once you reply to them. Sam Ovens:	Isn't it just like getting someone's email address? Andrew:	Except with kind of 90 to 100 percent open rates and 80 percent click through rates. So essentially it's the new form of email but it's much more interactive and you can see exactly what they're doing in the chat bot while they're going through it. You can segment the audience based on what they click on. And you can put together a much more personalized response or send them more personalized, valuable information based on what they're doing in the chat bot. Whereas email, you send it and then based on what they respond, that's the only way you're gonna know whether or not that they're interested in your product or not. Sam Ovens:	Got it. Because I remember we've looked at it and we tested it alongside our funnel and it didn't beat it, you know what I mean? So do you know the numbers of what the chat bots do? Andrew:	Yeah. So it's not ... Essentially, the way to think about it is not kinda propping it up and stacking them against each other. It's using it in conjunction with one another. So if you're still gonna use your VSL funnel, you can 100 percent do that through the ads that you run. But by implementing a messenger chat bot Facebook ad, someone can opt into it by clicking a call to action button or by typing a specific trigger word if that's the type of ad that you've set up. And once they do that, then they become subscribed to your chat bot. So then, you can followup with them like I said. But at the same time, if you don't wanna do it that way, you know what you've taught us through the fragmentation funnel is that your cost per click, your cost per acquisition increases or decreases by how far they go into your funnel. Andrew:	Whereas if you implement that chat bot right then and there and they click into it, no matter if they continue through a fragmentation funnel or not, you have direct access to follow up with them. So you're not hoping that they go to your landing page and submit their email address. They just have to click on your ad and now you can followup with them directly. So stacking it up by ... messenger chat bots can exist anywhere and everywhere. Through a simple URL, you could put it in a link in your bio. You could put it on a YouTube page, you could put it in your Twitter feed [inaudible 00:14:22]. You can put it on your website. It can exist on every single page or it can exist on your home page. It can be there as a small little button in the bottom right hand corner. It could be an entire page takeover. The fact of the matter is as soon as someone interacts with it, that's their way of opting in. And it becomes traffic that you control at a much lesser cost than standard marketing practices today. Sam Ovens:	Got it. But the main thing's getting the customer, right? Andrew:	Right. Sam Ovens:	So do you know if it actually gets customers at a better rate than a standard funnel? Andrew:	It depends what your call to action is. If you're asking them to purchase something right then and there ... Let me put it this way. The numbers have come out that if you have 100 percent, like even if you add a small discount into something. Say someone comes to your page, they're not purchasing something right away. In messenger chat bots, with 100 percent open rate, say your entire email list opened your message, if you did a followup with someone who didn't purchase, and say you offered them a 15 percent discount, the numbers are in that 50 percent of those people purchase. Sam Ovens:	How did you get that? Andrew:	That's based on an actual breakdown of someone coming in to a messenger chat bot, say through an e-commerce platform. They come in. You track them through it, they don't purchase. So you send them a followup with a discount. And 50 percent of those people purchased. Sam Ovens:	But who's numbers are those? Andrew:	That's based on a study, I think it was a study done through Many Chat. My business partner kind of put that forward to me. It's Many Chat and Bot Academy. That's where kinda we've been trained through. It's kinda the leading Bot Academy training. Sam Ovens:	Because you've always gotta be aware by studies done by people who are in the software, you know what I mean? Andrew:	Right. Sam Ovens:	Because I would bet a million bucks that isn't true. 50 percent of people that visit buy? I mean I'd be a billionaire if I implemented a chat bot, you know what I mean? Andrew:	Based on a discount value prop added. It also comes into effect, let me put it this way. With a high ticket item such as yourself, you're not gonna see as great of a conversion if someone came in and was buying $27 e-commerce product. Sam Ovens:	Got it. Andrew:	But that was based on a lower price point. Sorry I didn't add that in there. In relation to your product, I'm sure the numbers would be different. Sam Ovens:	Because I wanted these chat bot things to work for me. And we tried them but we didn't see the numbers, you know what I mean? So I'd be really interested, if you could show me a funnel that like the standard fragmentation funnel we do and the standard benchmark numbers. And then one with a chat bot working in conjunction with it. And a true A B test. Because then I would change the training and everything, you know what I mean? Andrew:	Let's do it. Sam Ovens:	But I haven't seen it and I want someone to show it to me. But no one can show me it. Andrew:	Let's jump off the call after the interview. We'll have a chat. Sam Ovens:	Cool. So you paired this with the coaching industry, right? Andrew:	Yes. Sam Ovens:	And so you're ultimately helping them get clients with the chat bot. And how's that going? Is it getting them clients? Andrew:	Yes. It is getting them clients. Like I said, whether or not, the most important thing that they're seeing is the retention rate. The retention in the ability to followup with people and segment them. And whether their kind of sales cycle prior to chat bot was short or long, the fact of the matter is is that every person that comes in is an opportunity to sell to whether it's immediately or down the line. And you can foster that relationship. And especially coaching that that's what they want to do is they want to build a relationship with people knowing that they are opting in to something that they can learn very intimate things about you or whatever you decide to put on your chat bot. Whatever coaching industry that you're in. Andrew:	The returns have been great. I mean we have clients spread across from people do grief coaching to people who do yoga coaching. I mean our yoga coaching client, they paid $3500 for us to set this up for them. And within two days, they got their money back with their first purchasing yoga course instantaneously. With the grief coaching, it's been really interesting to watch because that's a different beast in and of itself. I mean people are going through very traumatic things in their life. And they opt in to the chat bot and something that you might put on your website is not the same thing you're gonna put in the chat bot because you have a lot more time and kind of flexibility to put in different sequences that are all related to different aspects of your coaching business. So through that, we've seen a lot of success in retention and people coming in watching the masterclass that they have and then jumping on a strategy session call with our client. Sam Ovens:	Got it. Cool. And I'm definitely interested in this one because I've always thought like if somebody has a problem, right? Like let's take the grief industry for example. Someone's in grief. That's their current situation. Their desired situation is to not be, you know what I mean? Andrew:	Yeah. Sam Ovens:	And then they wanna get there. Let's say there's point A and B. They wanna get there across the shortest path possible, you know what I mean? Because there's no point prolonging it. No one wants to prolong grief. So isn't it faster just to go like ad, bam, and to call and then buy. I guess what you're saying is you still have that path. That is still the main path. But for people who fall off in that path, that's what the chat bot's for, right? Andrew:	Yeah. So essentially, you could still set up something to- Sam Ovens:	Because you don't replace the main path with a bot and force someone to go through all these things, right? Andrew:	No. Not all. Essentially, the bot is great like if they see your ad and they click on it and it's one that it's a messenger chat bot ad. The minute that they click on it, they go. And you can send them to whatever sequence. So your ad doesn't necessarily have to run to the welcome message and then they're kind of "Okay, where do I go next?" You can literally send them to any part of your chat bot based on the ad that they came from. Andrew:	So if they click on something that deals with the masterclass, you know learn how to cope with your grief, that could send you within the chat bot and you can see and view that masterclass. And at the end of it, you can schedule a call, fill out a survey. But the minute that they clicked on the ad, they became subscribed to your chat bot. So they're still getting all the value, it just comes in a different form. So it's not like they go to the landing page and if they don't go to the landing page, are you gonna re-target them or are you gonna sink more money into that? You know you don't have to do that with messenger, with messenger chat bots. Because you get them right at the point of contact. And now they are in an ecosystem that you have direct control over and you can message them or directly speak to them while they also go through your intended outcome, your intended call to action for them to book a strategy session call with you. Sam Ovens:	Got it. So they can click on like an ad and then that will open up a chat, and then you can send them a link straightaway in that chat to the landing page. Andrew:	If you wanna get their email address. That's not necessarily the native aspect of messenger. Building a messenger list in and of itself is a list. So if you wanna get their email address, you could still do that through a different way in the chat bot. But you wouldn't necessarily get them to click on an ad that sends them to the bot and then you ask them for their email address- Sam Ovens:	Yeah but I mean don't we need to get them to the video? Andrew:	You can have the video in your chat bot. Sam Ovens:	I got you. And then there would be a link beneath that video to book a strategy session. Andrew:	Yeah. Doesn't necessarily have to be ... like it's native within messenger but yeah, the next part of the sequence could be like "Thanks for watching the video. If you're interested in booking a strategy session call, click the link below." Sam Ovens:	Because the main thing's getting the call, right? Not just getting a list? Andrew:	100 percent. But here's where messenger comes in that's the added value benefit is that they will come in and if they do watch that video and then they don't click the link within your chat bot to book the call, you now have direct access to them. You can now literally go into messenger, you can see that they watched the video and they stopped interacting with your chat bot and say "Hey Sam. I hope you got value from the video. If you're interested in still booking that strategy session call, here's the link. Or please click that link." So you have the ability to followup with them now. Sam Ovens:	Got it. But the main thing is always the people that we want the people to go through and schedule a call, right? Andrew:	Absolutely. I'm kind of jumping short to seeing that where a lot of people fall off, you know they always try to recalibrate their fragmentation funnel being like why aren't more people clicking through to book that call? I'm saying that this is a big value add to show you how you can kind of rekindle that relationship or pick up right where you left off. No matter what, you can still build out the sequence within the chat bot to go from video, booking the call, survey, and then actually jumping on the call. You can 100 percent do that in the chat bot. Sam Ovens:	Got it. Cool. Now we know what you do and the problem you solve and everything and how you use chat bots to help them improve those conversion rates. How did you go about getting your first client? Andrew:	Direct outreach. So essentially, actually before direct outreach, it was kind of looking into the warm market of the network that I have. So I kind of deep dove into the people that I know to see if through one, two, three, four, five degrees of separation if they knew someone who was a coach. We kind of connected, had some strategy sessions that way. Got our first client that way. But we were also doing direct outreach. And in the beginning, you know cash was kind of tight starting up a new business. So with my business partner, he was doing a lot of the technology focused aspects of the business while I was doing a lot of the outreach and strategy sessions. You know as we started to get more clients on board, we then hired a VA that was strictly focused on direct outreach. So falling in line with the course, we continued to kind of prospect that market until we got proof of concept. So we waited until we had about three or four clients on board. Andrew:	And then we intended to go into Facebook Ads. We haven't run ads for that market. But we actually have gone down the path of joint venture partnerships. So specifically for the automotive industry, for coaching, we have a source that kind of continues to give us clients, which has been extremely helpful. We still focus a lot on direct outreach. We're now moving into Facebook Ads, which we're very excited to kind of implement with the messenger strategy. Because we're essentially selling a service by getting people to opt in by using the service. So by kind of opting in to it, going through our kind of version of the VSL and the fragmentation funnel in the chat bot, they are essentially going through something that they will get on a strategy session call with. And they're going through this and testing out exactly what they would get. So it's very interesting that way. It's very cool that way. And then with the automotive- Sam Ovens:	Do you dream about chat bots? Andrew:	Yes. They're stuck in my head. Sam Ovens:	Whenever you start talking about chat bots, you start smiling. Andrew:	It's exciting. Sam Ovens:	I'm like here we go again. We're gonna go into the chat bots again. It's cool. You can tell that you're obviously passionate about them. Andrew:	Yeah it's just really exciting to see something new in the market that is producing at a very high level. With the automotive industry, we have a partner who's been in the industry for 12 years and they run specific campaigns. Like trade your car in, campaigns like that. And we just started implementing these campaigns but with chat bots. And they've just been absolutely gang busters. Like the amount of people that are opting in through the ads for each individual dealership, our partner has something about 300 plus dealerships across North America. So we didn't intend to go down the JV partnership route. We actually stumbled upon it. I know in your course, you teach a lot about JVs, you can partner with them, get into their Webinars, get introduced. We were just fortunate enough because with chat bots, it's something so new. And there's so many different angles that you can come in and implement a chat bot for your business. Sam Ovens:	Got it. And then with your offer, is it a done for you offer? Like what are you promising to the client and how are you packaging it and pricing it and all that? Andrew:	Yeah. So essentially, we're in a done for you stage right now. Until we dive deeper into the markets to figure out if there's one specific type of package that we can offer that we can kind of mass-produce in a way as a service, right now, the way it's set up is that we have an onboarding call. We figure out what it is that they want to have in their chat bot, what their business looks like, and how they want that to unfold. So there's a setup fee associated with it. A one-time setup fee. And we give them the option of either we set it up for them and they're tech savvy enough to take on the chat bot themselves, or we get on a monthly with them. A monthly retainer. And we kind of manage that for them month over month. Sam Ovens:	Got it. And how do you price it? Andrew:	So chat bots can run anywhere from $1500 setup, $1000, $1500 setup all the way up to there's some very sophisticated chat bots out there with some natural language processing. You could be like 20, $50,000 setups. So with us, it's basically on the client's need. How sophisticated it is. What's the amount of tech that's gonna need to go into it? Is it just gonna be you know standalone chat bot or is it gonna be one that involves some coding? Do you have something on your back end that is not a zappier connection or Google Docs? Is it your own proprietary software? It kind of reflects that in and of itself. And then on a monthly fee, it matters how much you want us to be involved. Is it just something that's gonna be a standalone and we're there for support or is it gonna be something there that you want us to do broadcast to your list? You want us to ensure that if you're running a lot of ads that the j-son codes that we have are up and running. They're perfect. They're connected. Everything is running very well. 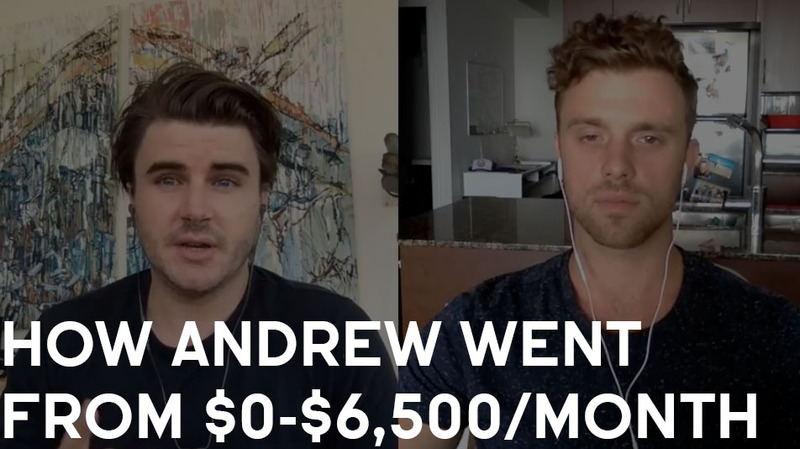 Andrew:	So a monthly could run anywhere as low as $500 for support all the way up to eight, 10K. Sam Ovens:	Got it. So you've got like a one off kind of done for you fee at the start to build the thing and then you've got a recurring fee that happens for kind of management? Andrew:	Yes. Sam Ovens:	Got it. Cool. And so what's next for you? Where do you wanna take this business to? Like 12 months from now, five years from now, what's the goal? Andrew:	I mean it's really cool because we're working with Kia now, Kia Canada, in the automotive sector. And working with a business that has a lot of moving parts, it'd be really cool to start opening up our kind of path into getting into more artificial intelligence with the chat bots. So it's not necessarily predetermined messages. It's more the chat bot has a brain. We're gonna put a brain inside the chat bot. That's one aspect that we're working on is we wanna work with some more bigger, big ticket clients. But at the same time, we want to also scale this into something where you know if we put it into the flywheel, the more clients we take on, you know it's not gonna diminish our returns and the energy that we expend in the business. So we are looking for kind of more along the lines of JV partnerships in a predictable market with a predictable solution for a chat bot that could be easily turned over and it's the same solution one after the other as opposed to kind of customizing it on each individual basis. Sam Ovens:	Yeah because if you do it for different industries in different applications, it's gonna be a totally new discovery process every time, you know? Andrew:	Yeah. No definitely. The next step is probably to jump into up-level consulting and figure out the best way to teach a market how to do this on their own. Sam Ovens:	Yeah you'd wanna nail it for like one type of market and then have like a template, you know what I mean? And you're always gonna have to personalize stuff. Like no thing will just work plug and play. But at least you know the flow of it, you know what I mean? Andrew:	Yeah 100 percent. Sam Ovens:	And it sounds like that's what you're doing in automotive. Andrew:	Yeah. So we kind of hit that with the first example I gave you, trading your vehicle. It's basically all the same for each individual dealership. It's just small, minute kind of copy tweaks that need to go in there. Sam Ovens:	So do you help ... I thought the niche was coaches. Andrew:	It's coach. We're in two different niches right now. We started off with coaching but the automotive industry kind of presented itself. With Kia, that was a reach out into a warm network to make a connection. And I came in, they were looking for Facebook ads and Instagram ads. And I thought to myself, I'd kind of kick myself in the pants if I didn't go in and pitch them a chat bot. So I took the meeting with that pretense. And I came in and before we kind of got onto Instagram and Facebook ads, I showed them the messenger chat bot. And then from there, one thing led to another, they were no longer interested in Instagram ads and Facebook ads. It was more along the lines of how do we develop this for our business? So that was kinda the break in into automotive. And then from there, [inaudible 00:33:51] into right now. Coaching and automotive. Sam Ovens:	Got it. Cool. And so you're pretty much gonna focus on the automotive one now? Andrew:	The automotive has a great opportunity to scale faster with kind of the partnership that we have. But we're very much in line with ... We're gonna be running ads for the coaching niche now. We're gonna kind of focus on Kia and focus on our JV partnership for automotive and then we're gonna be running ads for coaches. So it's kind of interesting. It's two different niches with two different kind of variations as to how we're approaching the market. It'd be nice to kind of find a good sync between the two. But the way that it's been unfolding has been working for us. Sam Ovens:	Got it. Cool. And since going through this whole program, this whole process, from like quitting your job, starting this thing, growing it to 6500, what would you say has been the most transformative part of that whole journey? Andrew:	I'd definitely say the mindset aspect of it. Elevating myself into understanding that who I was in my nine to five was definitely not the person that I am today. And it was not the person that I needed to become in order to be successful in what I'm doing. I'd say the most influential and most impactful part of the training that I've gone through has been the mindset training. I've definitely needed to elevate myself every step of the way. I've been in sales my whole life. But going into a meeting with high-level execs for a large automotive company definitely caused a shift. And instead of going after the initial direct outreach method of prospecting clients, moving into kind of more of a standpoint of looking to partner up with JV partnerships. That kind of opened up a new mindset that I had to take on. So you know there's a lot of different hats that I have to wear but at the same time, I'm constantly evolving to kind of push the business forward and that's been not just the most impactful and rewarding, but it's also been the most exciting aspect of it. Sam Ovens:	Got it. And then I'm sure you've seen what a lot of the members in the community are struggling with or going through and you can kind of see the things that hold them back and stuff like that. What would your number one piece of advice be for them? Andrew:	I'd say based on experience, I would say to stop overthinking things and just take at it with an experimental attitude and just do more. Don't overanalyze. Don't try and tweak your script to make it that perfect ... it's very subjective. Just go to market, get the feedback, leave your fear at home, and just continue to take more action. Because a lot of things open up and a lot of interesting things happen. JV partnerships was something far down my list in terms of the way that I wanted to prospect my markets, but it's something that unfolded the way that it did. And instead of being kind of fearful that I wasn't ready or going through the course and seeing that JV partnerships was something that you don't want to take on at first, things happen the way that they do for a reason. And you need to kind of stop theorizing about everything that you're doing and just kind of take more action and see the way that things unfold for you. Sam Ovens:	Cool. That's good advice. Well thanks a lot man, for coming on and sharing your story. And I'm sure it's gonna inspire a lot of people to start their own consulting business. And it's probably gonna inspire some people to take a look at chat bots too. And then you can send me those numbers. Andrew:	You bet. Thank you for having me on. I really appreciate it. I really value your course. Sam Ovens:	Thanks. See you. Andrew:	Cheers.